The Light Utility Helicopter, UH-72A LAKOTA will provide general aviation support for CONUS based Table of Distribution and Allowance (TDA) and Table of Organization and Equipment (TOE) aviation units in the active and reserve components. The UH-72A platform will provide the flexibility to respond to Homeland Security (HLS) requirements, conduct civil search and rescue operations, support damage assessment, support test and training centers, perform generating force missions, augment the HH-60 Medical Evacuation (MEDEVAC) aircraft, and provide support to Continental United States (CONUS) counterdrug operations. The Lakota can be maintained and operated at half the cost of the older OH-58A Kiowa helicopter that it replaces. The Lakota functions as the premier aircraft for civil support, search and rescue, and homeland security missions. Compared to the Kiowa, which is a single-engine helicopter, the Lakota has twin engines; The UH-72A conduct general support utility helicopter missions and execute tasks as part of an integrated effort with other joint services, government agencies, and non-governmental organizations. The UH-72A provides time-sensitive transport of supplies or key personnel, air mobility to assist civil authorities through the execution of search and rescue or disaster relief operations, advanced warning/detection of external threats to include threats to US borders, augmentation of air ambulance capabilities, and limited command and control operations in the conduct of HLS. The UH-72A Light Utility Helicopter (LUH) is a commercial aircraft designed to conduct light general support tasks in permissive, non-combat environments. Those tasks include civil search and rescue, personnel recovery, evacuation, counter-drug and limited civil command and control operations in the conduct of Homeland Security. The fielding of the LUH was part of an ongoing Army-level effort to transform its aviation capability through the deliberate reinvestment of funds from the canceled 2004 Comanche program. The Army National Guard was slated to receive the majority of the 322 new aircraft. Initial aircraft would be sent to the National Training Center, Fort Irwin, California for medical evacuation missions in January 2007. The UH-72A Lakotas will replace UH-60 Black Hawks, which would then be transferred to the National Guard for operational missions. On 30 June 2006 the US Army awarded a contract for the production and contractor logistics support of the Light Utility Helicopter (LUH) to EADS North American Defense of Arlington, Virginia. The LUH is intended to perform its various functions only in permissive, non-combat operational environments. The primary users for the LUH were planned to be the Active Army Table of Distribution and Allowances units and the Army National Guard. 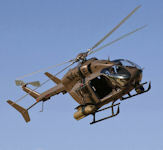 The Army intended to procure and field a total of 322 Light Utility Helicopters. This commercial/NDI aircraft was solicited on a full and open competition basis. There were 5 initial offers received. The contract base year plus options was designed to cover 10 program years. Total amount obligated at award was approximately $43M. Total estimated value of the contract, including options, was $2.3B. The EADS UH-145 (originally designated by the manufactuer as the EC-145) Light Utility Helicopter was designated the UH-72A, the next available designation in the H mission sequence, as the winner of the VXX competition had been designated the VH-71 Kestrel. The LUH contract expanded EADS' 20-year heritage as a helicopter supplier to US Homeland Security and law enforcement agencies, including the US Coast Guard, US Customs and Border Protection, DEA, the FBI, and numerous state and local law enforcement agencies across the United States. Commercial customers of the Eurocopter EC-145, from which the UH-145 was derived, included STAT MedEvac, Vanderbilt Lifefight, Air Life, the University of Massachusetts Memorial Medical Center, CJ Systems Aviation Group, Lee Country (Florida) Rescue, and Allegheny General Hospital as an air ambulance and Taylor Energy LLC for offshore logistics missions in the Gulf of Mexico. EADS North America led a UH-72A team of industrial partners and subcontractors committed to delivering the best-value Light Utility Helicopter solution to the Army. Partners included American Eurocopter, which handled the helicopter's production, assembly, delivery and training for the Army, CAE, the supplier of UH-72A cockpit procedural trainers, and Turbomeca USA, which produces the aircraft's Arriel 1E2 engines. EADS North America is the North American operations of EADS, the second largest aerospace and defense company in the world. EADS North America has been a leader in all sectors of defense and Homeland Security, it and its parent company, EADS, contributed over $8.5 billion to the U.S. economy and supported more than 174,000 American jobs through its network of suppliers and services. With 11 operating companies located in 32 cities and 17 states, EADS North America has offered broad array of advanced solutions to its customers in the commercial, Homeland Security and national security sectors. As of late 2006, the Army had ordered a total of 42 UH-72As from EADS North America, along with the associated training services for pilots and maintenance personnel. EADS North America officially delivered the U.S. Army's first UH-72A Light Utility Helicopter on 11 December 2006, marking the beginning of this major defense program with a requirement for up to 322 rotary-wing aircraft and a potential total life-cycle value of over $2 billion. The initial UH-72A was received by the Army during a delivery and naming ceremony in Columbus, Mississippi, where the twin-engine helicopter was produced. EADS North America was to deliver a second UH-72A before the end of 2006, responding early to the Army's rapid phase-in schedule for the helicopter, which would be used on logistical and support missions within the United States. Forty more LUHs currently are in the production cycle for delivery to the Army during 2007 and 2008. At the delivery ceremony, the Army also unveiled the UH-72A's official name: Lakota, which is a Native American Indian tribe of the Great Sioux Nation. Naming the UH-72A the Lakota continues the service's tradition of naming its helicopters after Native American tribes. The Army has a long-standing tradition of using American Indian names, such as terms, tribes and chiefs for its helicopters. In the case of the Lakota aircraft, the linkage is between the Lakota legacy as stalwart defenders of their homeland and the nature of the aircraft's intended domestic missions. Gen. Richard A. Cody, Vice Chief of Staff of the Army, and Joe RedCloud, a chief of the Oglala Sioux Tribe, Lakota Nation, accepted the Army's first Lakota Light Utility Helicopter. "The Light Utility Helicopter - from concept development to material fielding to rapid deployment - is not only serving as a catalyst for change across the Army, it is also accelerating the speed of Army aviation modernization and integration with other services and government agencies," said Cody. "We're pleased that you honor our tribe by naming this helicopter Lakota. You are not only honoring our past, you are recognizing that we are still here, joint partners in the heritage of the promise of America" RedCloud told the audience. The UH-72A's industrial activity was planned to be centered at American Eurocopter's Columbus, Mississippi facility, which was to undergo a major expansion to accommodate the LUH program. The production line of the UH-72A, who's predecessor the EC-145 is currently built in Germany, would be duplicated in Columbus through a series of steps that begins with partial assembly, followed by full assembly and the subsequent US manufacture of major subsystems. The Columbus, Mississippi factory of EADS North America's American Eurocopter business unit underwent a major expansion to support the UH-72A production, assembly and delivery. Industrial activity at Columbus started with the LUH's build-up and acceptance for delivery, and would transition to full-scale production with the facility expanding to a total covered area of 325,000 sq. ft. expected to be completed in the fall of 2007. Employment at the American Eurocopter facility, which is located adjacent to Columbus' Golden Triangle Regional Airport, had grown steadily since the facility was opened in 2004 with an initial staff of 44. By late 2006, employment at the facility was approximately 140, and was expected to continue to grow to approximately 330 in support of UH-72A production and assembly. In addition to the UH-72A program, activity at the Columbus factory included production/assembly of AS350 and EC120 helicopters for US Customs and Border Protection and other government/law enforcement agencies in North America, as well as support for the U.S. Coast Guard's planned modernization of its HH-65 Dolphin helicopter fleet. "I am very pleased that the highly skilled workforce in Columbus and East Mississippi is putting our state at the forefront of this important new national defense initiative. We're proud to be a partner in the UH-72A program and with EADS North America's industrial growth," Mississippi Governor Haley Barbour said. "EADS North America is meeting its goal of establishing a major manufacturing presence in our state," said Senator Thad Cochran of Mississippi. "Its continued growth will be a substantial economic benefit to Mississippians." "With today's UH-72A delivery milestone, Mississippi expands its contribution to and presence in America's aerospace and defense community," said Mississippi Senator Trent Lott. "The U.S. Army and EADS North America can count on the dedication of our entire state in meeting the Light Utility Helicopter delivery requirements, and for other key homeland security and defense programs in the future." Mississippi's Third District Representative, Congressman Chip Pickering, said, "Today marks another milestone in Mississippi's commitment to our men and women in uniform and to protecting the peace and security of our citizens at home. We in the Golden Triangle Region are proud to be the home of the UH-72A Lakota." "The UH-72A will strengthen our nation's defense, benefit Mississippi's economy and create high-paying jobs," stated Congressman Roger Wicker, representing the First Congressional District of Mississippi. "This is certainly a win-win program for both the state and the nation." In March 2007 the Government Accountability Office declared that the production maturity of the UH-72A was high since the selected system was a Federal Aviation Administration (FAA) certified aircraft. The system was scheduled to undergo limited operational test and evaluation in March 2007 and its initial operational capability was planned for May 2007. As a result of the Commercial, Off-the-Shelf nature of the helicopter, the LUH program office stated that the system's five critical technologies were mature in the 2007 GAO audit. These critical technologies were network-ready communications, cabin size sufficient for 2 crew and 6 passenger seats, force protection defined as the capability of the crew to operate all flight controls while wearing standard protection suits, survivability defined as meeting FAA standards for crashworthy seats and fuel tanks, and performance defined as the ability to carry 2 patients on litters with a medical attendant and equipment. Program officials stated that no development efforts were to take place and that the aircraft was not expected to be modified. The Army planned by that time to acquire a total of 322 aircraft. Limited operational test and evaluation was conducted in March 2007. The system was in low-rate production and 16 aircraft were delivered as of November 2007. Full-rate production was approved in August 2007. It was reported in a subsequent GAO assessment in 2008 that four modifications were approved to be added to the aircraft: a secure military radio, a cabin temperature ventilation system to mitigate a temperature elevation observed during limited operation test and evaluation, an engine inlet barrier filter, and a modification to the medical evacuation mission support kit. Program officials told the GAO that no development efforts were necessary for the aircraft or the modifications. The assessment also added that the helicopter would not fly combat missions or be deployed into combat areas and the contractor would provide total logistics support. Due to a reprogramming of funding in FY07, some of the aircraft buys were moved to later in the program. This action and the four modifications resulted in an increase in total procurement costs. The FY09 budget request provided for the procurement of 36 aircraft. Funding also provided for fielding, engineering services, and program office support. The AAS-72X was a proposal for the U.S. Army’s next generation Armed Aerial Scout (AAS) requirement. It was a derivative of the American Eurocopter EC145 civil twin used as the basis for the Army’s UH-72A Lakota light utility helicopter. The Armed Aerial Scout program was to replace the previous Armed Reconnaissance Helicopter program. An Analysis of Alternatives preceeded a Request for Proposals is planned to be issued in 2014. The U.S. Army had until December 2012 to decide whether to proceed with the program. On 29 November 2012, Army officials decided to proceed with the Armed Aerial Scout program to acquire a new scout helicopter. On 8 January 2013, the Army began redrafting the presentation for the service's vice chief of staff before they move ahead with a competition. Vice Chief of Staff General Lloyd Austin III requested more data from the voluntary flight demonstrations done on helicopter entries, as well as taking into account the pace of other technologies, such as unmanned capabilities and future sensors. EADS North America unveiled its Armed Aerial Scout 72X+ (AAS-72X+) April 2, 2012 at the annual Army Aviation Association of America convention. The AAS-72X+ will offer the Army greater power, range, endurance and payload capacity when operating in 6,000 foot altitude and 95 degree environments, commonly known as “6K/95 high/hot” conditions. EADS North America image. The AAS-72X+, an armed derivative of the Army’s UH-72A Lakota Light Utility Helicopter would be manufactured by the company’s American Eurocopter business unit in Columbus, Miss. The AAS-72X or AAS-72X+ could be built and delivered at a cost competitive with the upgrades planned for the Vietnam-era OH-58 Kiowa Warrior and fielded to Army units as early as 2016. This variant was based on the commercial EC-145T2 aircraft which incorporates the more powerful Turbomeca Arriel 2E engines with dual channel FADEC, a Fenestron tail rotor for improved anti-torque, an upgraded transmission, the Helionix glass cockpit and avionics suite, and a 4-axis autopilot system. These elements of the AAS-72X+ offered the Army greater power, range, endurance and payload capacity when operating in 6,000 foot altitude and 95 degree environments, commonly known as “6K/95 high/hot” conditions — the most demanding environment for rotary-wing operations. The AAS-72X+’s performance exceeded the Army’s previously published 6K/95 endurance requirement of 2 hours and 12 minutes plus a 20 minute fuel reserve, while carrying a 2,800 pound useful payload for mission equipment and crew. EADS North America had delivered more than 210 UH-72A Lakotas to the Army and five the U.S. Navy, all on schedule and on budget.